Lost Vape Orion DNA Go Kit comes with 2ml refillable pod and 950mAh built-in battery with 40W max output. There are 3 power output modes including low, medium and high for your option. It is equipped with Evolv's advanced DNA Go chip and Micro USB port for charging and upgrading firmware. It also provides multiple safety protections to ensure safe use. Lost Vape Orion refillable pod cartridge features top filling design that are convenient to refill liquid. Lost Vape Orion DNA Go Starter Kit will bring you different vaping experience. 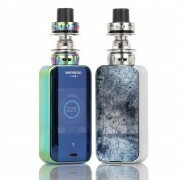 ☞ 6 months warranty period for Lost Vape DNA Orion kit.